I just love restaurant-quality meals that are simple enough to make at home, and this one is no exception! 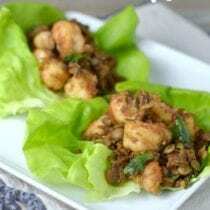 This is a fun twist on lettuce wraps that will impress your family (and company) for sure! Plus, since lentils are one of the fastest cooking pulses (see below) and it takes just minutes to cook shrimp, this could easily be a weeknight meal. Until recently, I did not realize that the word “pulses” was a common international term for the family of legumes that includes dry peas, beans, lentils, and chickpeas. It’s funny to learn something new about a food group we’ve loved and enjoyed for many years. Pulses are great for so many reasons. First of all, they are a real food! And they’re also easily accessible, affordable, and sustainable. As a Pulses Ambassador (in honor of the UN naming 2016 the International Year of Pulses to increase awareness around the benefits of pulses), I’m proud to include this recipe in a great little series with so many other yummy dishes. Take the Pulse Pledge to formally commit to adding pulses into your weekly meals! Combine the lentils with 1 1/2 cups water in a saucepan over high heat. Once it boils, turn down to a simmer and cook uncovered until the water is almost all the way evaporated and the lentils are tender, about 20 - 30 minutes. Heat the oil in a large skillet or wok over medium heat. Sauté the green onions until they soften, about 2 - 3 minutes. Add the shrimp, lentils, ginger, and red pepper to the pan. Cook while stirring until the shrimp is pink and cooked all the way through, about 4 - 5 minutes. Stir in the soy sauce and sesame oil and let cook down for a minute or two. Sprinkle on the cilantro, spoon into lettuce cups, and serve. 1. Gluten-free when using gluten-free soy sauce. Previous Post: « Should We Rewash Pre-washed Greens? Definitely going to try this one very soon! 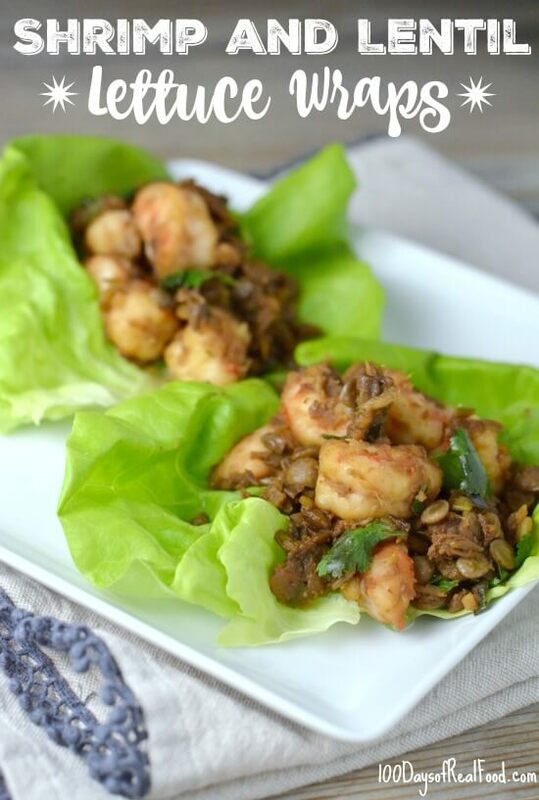 I love lettuce wraps just never thought to use lentils & shrimp. Thank you for this recipe. Would you want to serve this with something else? I portion seems small for my husband for dinner. Am I the only one who thinks so? Lisa, this one looks great! I think everyone in my family will enjoy it. Thanks so much for sharing. I love this recipe which I plan to serve with sushi white rice. Lisa, I used your challenge again in my First Year Seminar classroom and as usual, the students who took the challenge said they had no idea that processed food had so many chemicals. They also found it hard to do the challenge, but once they learned how, they became converts. Yaaay Lisa!! I added a whole grated carrot to the onion and of course garlic. We garnished with chopped peanuts and sriracha! :) fantastic recipe – fun info on pulses. Looks so delicious! My kids will surely love this! I’ll give this a shot! :) Thanks for sharing!